What a way to enter the holiday season. Verizon Wireless has suddenly found itself with arguably three of the hottest Android smartphones of the year, just as the holiday shopping season begins. There’s the just-announced HTC Rezound, the “Pure Google” Samsung Galaxy Nexus and what brings us together today -- the Motorola Droid RAZR. Yes, the RAZR -- the flip phone that became as cliche as it was once iconic -- has been reborn in the smartphone era. And it should surprise no one that Android is at the heart of its reincarnation. And Motorola, which led the march toward thinner, lighter and bigger smartphones more than a year ago with the Droid X, has changed things up again with the RAZR. But the Droid RAZR’s eccentricities may also be its undoing. 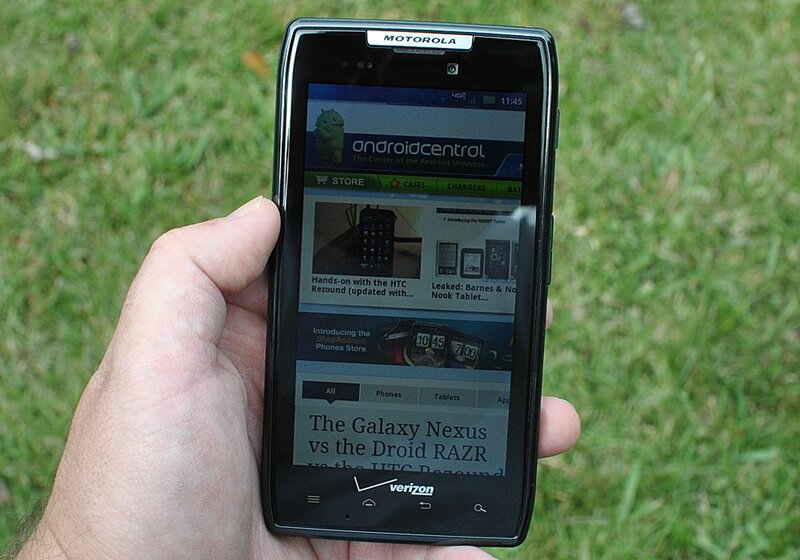 Read on to find out why in our complete Droid RAZR review. It's fast, it's thin, it's got a gorgeous high-resolution display, and it's running the most recent version of Android available (at least for a few more weeks). Motorola has already promised an update to Ice Cream Sandwich. Good camera, and has Verizon 4G LTE data. May be too large for some; is about the widest phone we've used. Battery can't be removed. Full of preloaded apps that you might or might not actually want. Yet another "best-of" phone for Verizon. But the Droid RAZR's size could be a bit much for some, and we've got real concerns about not being able to swap out the battery for a fresh one when needed. The Droid RAZR certainly continues the theme of 2011 -- that is thin, light, and big. Design-wise, it's not unlike the Droid X and X2, only refined over the months, and significantly slimmed down. It's got the same bulge up top for the camera assembly, but it's far less noticeable. It's worth noting that when you hear Verizon and Motorola crowing that the RAZR is only 7.1 mm thin, they're talking about the thinnest part of the phone, not the top section, which balloons up to 10.5 mm or so. OK, that's hardly what we'd consider to be fat, especially for 4G LTE phones, which tend to a bit on the portly side. The Droid RAZR is pretty damn wide, though, at some 2.71 inches, and tall at 5.15 inches. This is not a small phone. But it weighs just 4.48 ounces. With a phone that takes up that much square footage, you might expect it to have an oversized display, too. But the Droid RAZR has a "mere" 4.3-inch Super AMOLED display with qHD (540x960) resolution. And in a word, it's gorgeous. Don't worry about the specs, really. It looks great, mostly. You may still occasionally notice a tiny bit of fuzziness on the edges of fonts. Or you might not. But gone is the checkerboarding of previous Motorola displays. Above the display is the Motorola logo and phone earpiece, along with the ambient light sensor and (thankfully) a hidden notification light. There's a front-facing 1.3MP camera there, too, with a square cutout letting it look forward. It kind of looks out of place, with the camera breaking up an otherwise immaculately black bezel around the display. Below the display is the Verizon logo and four capacitive buttons in the menu-home-back-search configuration. There's a tiny pinhole mic down there as well. On top of the phone is the 3.5 mm headphone jack, microUSB port and HDMI-out. The power button's been moved to the right-hand bezel. For those of us who review phones for a living, that's a pretty big shift that makes us think we're using a Samsung phone, not Motorola. But you'll get used to it quickly enough. (There's also a nice little texture on the power button.) Below it is a small, one-piece volume rocker. There is no removable battery. That's right. Flip the Droid RAZR over and you see a huge tract of patterned soft-touch paint -- supposedly it's Kevlar, but we're not going to shoot it -- with the Moto batwings and other logos and FCC identifications stenciled on. It's pretty expansive, but it also doesn't move. The top section houses the 8MP camera (more on that in a bit) with flash, and speakerphone. There are a couple more mics on the rear of the phone, too. The Droid RAZR is powered by a TI OMAP 4430 dual-core processor running at 1.2 GHz. In a word, it's fast in daily use as a smartphone. Fast to boot, fast in the home screens and launcher, and apps run as you'd expect. (Web browsing feels especially fast.) Don't worry about benchmarks. (We don't.) Don't worry about whether you're using both cores. (The phone will take care of that for you.) It's fast. Period. Data speeds are what you'd expect from Verizon. 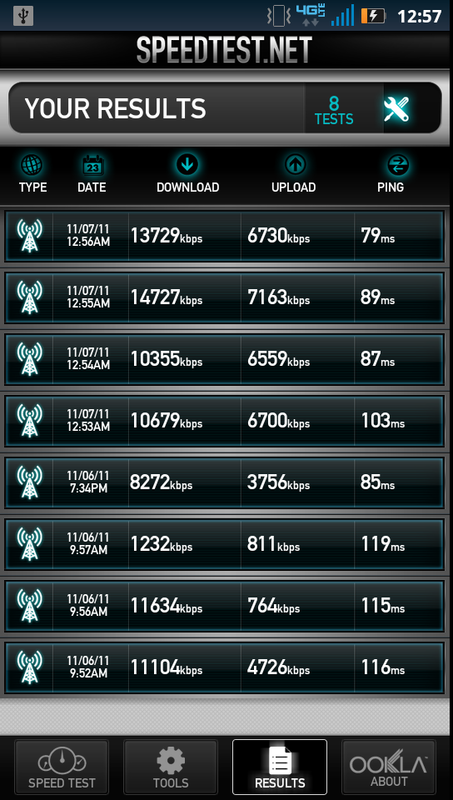 Data on 3G is fairly fast, and data on 4G is definitely nothing to sneeze at. But we have seen more bouncing back and forth between 3G and 4G than we'd prefer to see. (Which is, to say, any.) Could be a disturbance in the force, or it could be the phone. Further use should help flesh that out. Fun fact: If you're in range of a Wifi network to which you've already added, the Droid RAZR can automatically turn Wifi on and reconnect. Even if you don't want it to. You've got about 2.5 GB of storage on which to install apps. (They can be moved to the "media area" -- ie out of that 2.5GB of storage -- if you so desire.) There's another 8GB of internal storage for music and pictures and app data or whatever, plus the aforementioned 16GB card. You'll find that the actual storage numbers are slightly lower than advertised, but that's normal. And an interesting side-effect of having dual storage like that is when you connect the phone to a computer in USB mode, it'll show up as two drives. So here's the thing. The Droid RAZR has a 1780 mAh battery, which isn't too shabby as far as capacity goes. But -- and this is a big "but" -- you can't swap it out for a freshly charged battery when things go south. We'll update our findings once we're more than a couple days in. But so far, with our normal usage, we're going to plug in whenever possible. 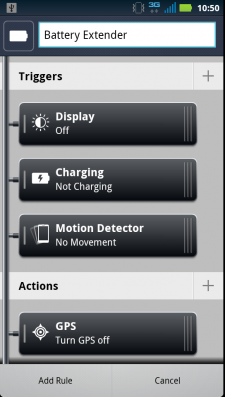 Not that you shouldn't do that anyway, but we're real wary of using the Droid RAZR as our only device while traveling. 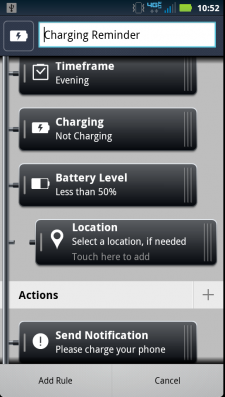 That said, Motorola's got a number of battery-saving options that can be enabled, as it does on other phones. But it's up to you to use them. The bottom line is this: Being Android users (and especially after using a number of 4G LTE devices), we're a lot more comfortable being able to replace a dead battery than we are hoping for a chance to charge while on the go. And for those who are wondering about battery pulls when something goes wrong (ie the phone freezes up) we've yet to experience anything that'd cause us to need a battery pull, but we'd imagine it works the same as on an Android tablet -- the power button should cure what ails ya. The Motorola Droid RAZR is running Android 2.3.5 Gingerbread out of the box. And, yes, Motorola has already announced it'll get an updated to the most recent major version of Android, "Ice Cream Sandwich," just as soon as it can. 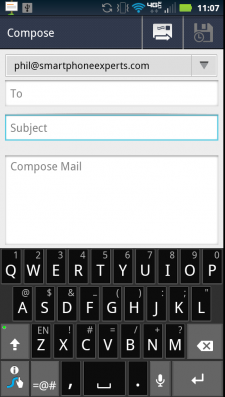 The basic home screen experience is relatively unchanged from other recent Motorola phones. There are three app shortcuts and the app drawer button docked to the bottom of the screen. You can swap out the docked app shortcuts by tapping and holding on them. You've got five home screens on which to put widgets, app icons and other shortcuts. The center home screen features Moto's excellent favorite contacts widget and app shortcuts for voicemail, e-mail (not Gmail), the browser and the Android Market. The home screens aren't terribly overburdened with preloaded widgets and what not, and the two bookend home screens are blank. Motorola's surprisingly good application that let's you wirelessly connect to a printer, either directly from the phone, or via a computer. On one hand, hit is a handy way to quit a misbehaving app. And we're fine with that. But it's also got an "Auto-end" blacklist, and that's where you can get into trouble. We'd recommend staying away from that part of it. 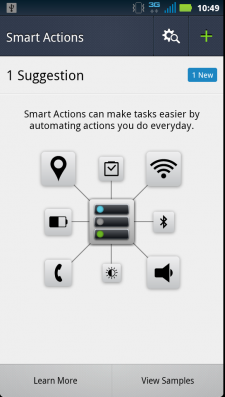 A very cool if slightly complicated app that conditionally changes settings on your phone via a set of rules. It's got a bunch of sample rules. "Home," for instance, assumes that you've come home and set your phone down somewhere, and automatically sets the ringer volume to 100 percent so you don't miss a call. You set the locations that will cause it to trigger. Or there's a charging reminder that will remind you to plug in your phone at night. Very cool stuff, though it can be a little confusing to soet up if you're not into workflows. This is Motorola's new music player/fitness tracker that doubles as a Bluetooth-connected watch that runs its own full version of Android. We'll have a full review on it later. Motorola's got a fairly slick and new method of getting music onto your phone. 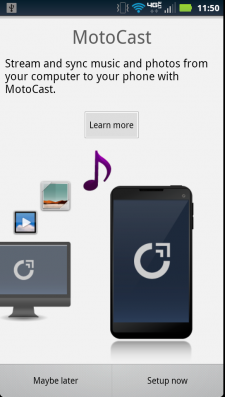 You'll need to load the MotoCast application on a computer, then set up some watch folders. After that, it'll automatically sync the media to your phone. You do have to be careful, of course, because you only have so many gigabytes of space on your you phone. We set it up to watch a folder with two albums. It synced quickly, and the music was easily playable on the phone. You've got two keyboards from which to choose: Motorola's multitouch keyboard, which looks like a skinned version of the stock Gingerbread keyboard, or Swype. 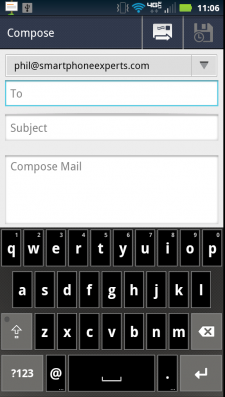 The multitouch keyboard is loaded by default, but it's also lacking in secondary functions. 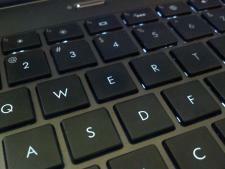 If you use basic symbols or punctuation a lot, you'll likely want to switch keyboards. The Droid RAZR has a pair of cameras -- a 1.3MP shooter on the front, and 8MP with flash on the back. Motorola's camera software is pretty darn good. You've got one-touch switching from the front and rear cameras, as well as for switching from still pictures to video. With a phone this size, we'd have loved a physical shutter button, but that's just not in the cards. You've got a few scene settings (auto, portrait, landscape, sport, night portrait, sunset and macro) from which to choose, as well as various modes (single-shot, panorama, multishot and timer). Notably absent is HDR support, which takes a series of pictures at various settings and stitches them together for a brilliant result. HTC has begun incorporating it into its camera app, but with the Droid RAZR you'll have to turn to a third party app. The panorama feature works great, as does macro. Image quality is fairly good, and we're not seeing the laggy focus like we did on the Motorola Droid Bionic. Not quite as fast as the "zero-shutter lag" of the Samsung Galaxy Nexus, but it's not bad, either. Note that by default the Droid RAZR shoots in 6MP "widescreen" at 3264 by 1840, so that your pictures fill the phone's screen. If you have to have the full 8MP, it's just a touch away in the settings menu. Video is decent enough at 1280x720, which is the default resolution, though it seemed to get a tad cloudy when we upped it to 1080p. For most of us, 720 is more than enough. The external speaker is nice and loud, just as we'd expect from Motorola. Moto continues the ridiculousness of having 15 volume steps from silent to loud. Craziness. 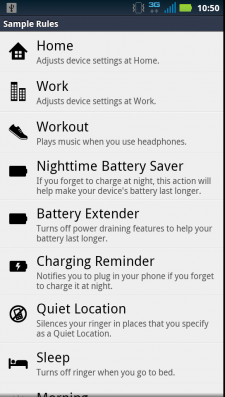 The RAZR has a "Sleep" mode in addition to Airplane Mode. Sleep sends it into some low-power sleep and shuts down the radios. It wakes quicker than a full reboot. The Droid RAZR touts a "splash guard." It might keep a mild splash from ruining the device, but with the 3.5 mm headphone jack and microUSB and HDMI ports left exposed, we wouldn't suggest taking it into the shower or anything. The Droid RAZR works with the Motorola Lapdock so you can run a full version of Firefox instead of using a proper laptop. There's encryption available, which should make IT departments happy. Call quality was fine on Verizon's network. Chalk up another one in the "Best phone on Verizon" category. We keep saying that a lot for Big Red, but it's no less true. The Droid RAZR's got a great screen, the dual-core processor keeps things plenty speedy, and Motorola's customizations keep getting better with each iteration. But we're very much aware of the fact that the Droid RAZR is a 4G LTE smartphone with a battery that can't be removed. That means you're either going to need to make sure you're able to plug in when needed -- and it's telling that Motorola included one of those little mobile battery banks in our review package. We'll give an update on battery life after we get a little more usage under our belts. That relatively major caveat aside, one thing is abundantly clear after even just a short time: Bringing back the venerable RAZR name with the ever-improving Droid line should prove to be a winner for Verizon, as long as the battery holds out.